Aerobic interval training is by far my favorite form of cardiovascular exercise. It doesn’t matter if I’m on a treadmill, in the gym or walking on the beach. I could be alone or training a group of clients. The bottom line is that if I’m working out, part of my routine is almost certainly composed of walking at variable inclines and speeds. That’s essentially what aerobic interval training (AIT) is. Instead of walking at a constant pace for prolonged periods of time, you simply push yourself to walk faster/harder for shorter intervals followed by less intense intervals in between. The impact of cardiovascular disease on the population at large is nearly incalculable. The likelihood of living a long life without encountering some heart-related health issue is exceedingly uncommon in the 21st century. And when the day comes that you are diagnosed with high blood pressure, high cholesterol or some degree of arterial blockage, the march toward putting you on medications to address these risk factors will likely begin. As it so happens, aerobic interval training appears to be a valuable tool in forestalling various forms of cardiovascular damage and dysfunction and may even serve to prevent the development of heart disease in the first place. 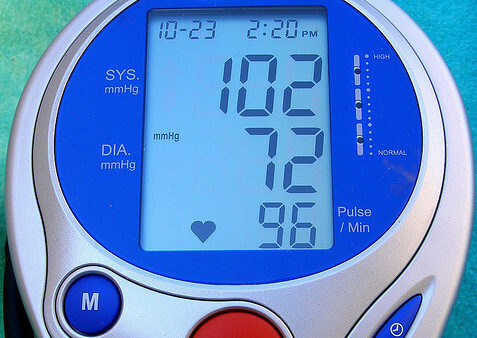 The interval training group demonstrated a reduction in systolic blood pressure of 12 mmHg as compared to only 4.5 mmHg in the continuous training group. Diastolic blood pressure declined by 8 mmHg in the AIT volunteers and only 3.5 mmHg in the MIT volunteers. I’m planning on trying your advice. It is not easy to just get up and start walking. It get really boring and don’t feel the need to do it another day. I walk on the treadmill for 15 minutes which burn 100 cal. It’s very boring… you’re right a person have to do walking and some type of aerobic exercise. And they have us doing just about the same schedule! Good to know we’re on the right track! Glad to hear it, Anne. Best wishes with your new exercise regimen! Quite informative! Thanks for the post! Effects of High-Intensity Intermittent Exercise Training on Appetite Regulation. Objective: An acute bout of high intensity intermittent exercise suppresses ad-libitum energy intake at the post-exercise meal. The present study examined the effects of 12 weeks of high intensity intermittent exercise training (HIIT) compared with moderate intensity continuous exercise training (MICT) on appetite regulation. Methods: Thirty overweight, inactive men (BMI: 27.2 +/- 1.3 kg/m2; V[spacing dot above]O2Peak: 35.3 +/- 5.3 mL.kg-1.min-1) were randomised to either HIIT or MICT (involving 12 weeks of training, 3 sessions per week) or a control group (CON) (n = 10 per group). Ad-libitum energy intake from a laboratory test meal was assessed following both a low-energy (LEP: 847 kJ) and a high-energy preload (HEP: 2438 kJ) pre and post-intervention. Perceived appetite and appetite-related blood variables were also measured. Results: There was no significant effect of the intervention period on energy intake at the test meal following the two different preloads (p >= 0.05). However, the 95% CI indicated a clinically meaningful decrease in energy intake after the HEP compared with LEP in response to HIIT (516 +/- 395 kJ decrease), but not for MICT or CON, suggesting improved appetite regulation. This was not associated with alterations in the perception of appetite or the circulating concentration of a number of appetite-related peptides or metabolites, although insulin sensitivity was enhanced with HIIT only (p = 0.003). Conclusion: HIIT appears to benefit appetite regulation in overweight men. The mechanisms for this remain to be elucidated. Physiol Behav. 2015 Dec 23. pii: S0031-9384(15)30218-3. Greater impact of acute high-intensity interval exercise on post-exercise executive function compared to moderate-intensity continuous exercise. Aerobic moderate-intensity continuous exercise (MCE) can improve executive function (EF) acutely, potentially through the activation of both physiological and psychological factors. Recently, high-intensity interval exercise (HIIE) has been reported to be more beneficial for physical adaptation than MCE. Factors for EF improvement can potentially be more enhanced by HIIE than by MCE; but the effects of HIIE on EF remain unknown. Therefore, we aimed to examine to what extent HIIE impacts post-exercise EF immediately after exercise and during post-exercise recovery, compared with traditional MCE. Twelve healthy male subjects performed cycle ergometer exercise based on either HIIE or MCE protocols in a randomized and counterbalanced order. The HIIE protocol consisted of four 4-min bouts at 90% of peak VO2 with 3-min active recovery at 60% of peak VO2. A volume-matched MCE protocol was applied at 60% of peak VO2. To evaluate EF, a color-words Stroop task was performed pre- and post-exercise. Improvement in EF immediately after exercise was the same for the HIIE and MCE protocols. However, the improvement of EF by HIIE was sustained during 30min of post-exercise recovery, during which MCE returned to the pre-exercise level. The EF response in the post-exercise recovery was associated with changes in physiological and psychological responses. The present findings showed that HIIE and MCE were capable of improving EF. Moreover, HIIE could prolong improvement in EF during post-exercise recovery. For the first time, we suggest that HIIE may be more effective strategy than MCE for improving EF. Int J Sports Med. 2016 Jun 3. 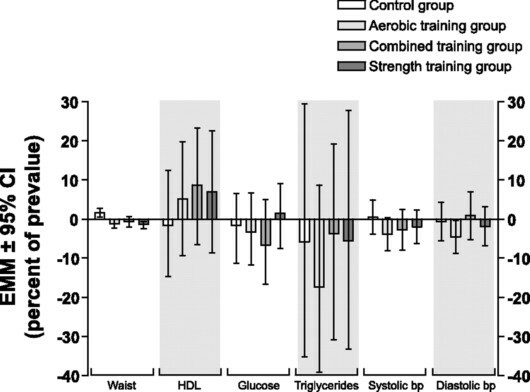 Low-Volume High-Intensity Interval Training as a Therapy for Type 2 Diabetes. Our purpose was to investigate the effects of low-volume, high-intensity interval training (HIT) on cardiometabolic risk and exercise capacity in women with type 2 diabetes mellitus (T2DM). Sedentary overweight/obese T2DM women (age=44.5±1.8 years; BMI=30.5±0.6 kg/m2) were randomly assigned to a tri-weekly running-based HIT program (n=13) or non-exercise control follow-up (CON; n=10). Glycemic control, lipid and blood pressure levels, endurance performance, and anthropometry were measured before and after the follow-up (16 weeks) in both groups. Medication intake was also assessed throughout the follow-up. Improvements (P<0.05) on fasting glucose (14.3±1.4%), HbA1c (12.8±1.1%), systolic blood pressure (3.7±0.5 mmHg), HDL-cholesterol (21.1±2.8%), triglycerides (17.7±2.8%), endurance performance (9.8±1.0%), body weight (2.2±0.3%), BMI (2.1±0.3%), waist circumference (4.0±0.5%) and subcutaneous fat (18.6±1.4%) were found after HIT intervention. Patients of HIT group also showed reductions in daily dosage of antihyperglycemic and antihypertensive medication during follow-up. No changes were found in any variable of CON group. The HIT-induced improvements occurred with a weekly time commitment 56-25% lower than the minimal recommended in current guidelines. These findings suggest that low-volume HIT may be a time-efficient intervention to treat T2DM women.